On December 16, 2016, students at Berkeley College in Woodland Park, NJ, blended fashion and artistic talents during A Knight of Style Fashion Show to give back to their community. Comprised of musical and dance performances while students modeled styles designed by their peers, the fashion show collected more than 200 toys for children in need during the holiday season. The toys were donated to The Three Doctors Foundation, New Jersey Community Development Corporation, the Boys & Girls Club of Passaic & Paterson, and Toys for Tots, who will deliver the toys to children in the community. In addition to representatives from the organizations and the Berkeley College community, Miss New Jersey USA Chhavi Verg and Miss New Jersey Teen USA Briahna Reinstein attended the event. 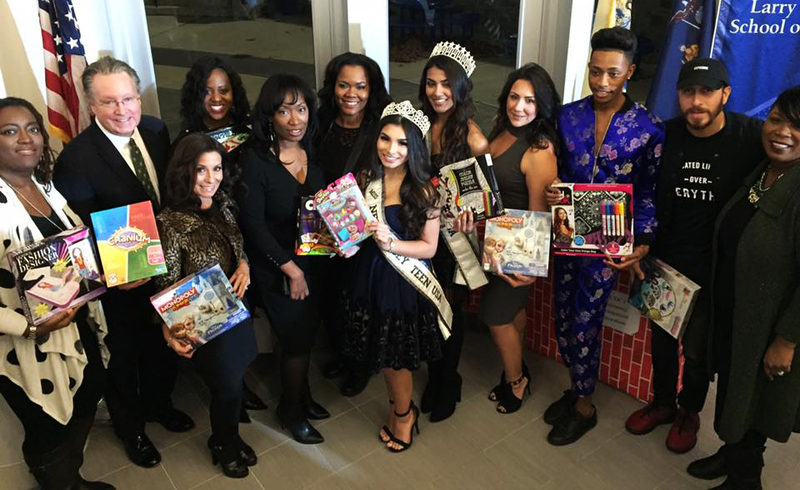 Photo Caption B: Berkeley College students in Woodland Park, NJ, collected more than 200 toys for children in need during A Knight of Style Fashion Show on December 16, 2016. From left to right: Janelle Giles, Berkeley College Director, Student Development and Campus Life; Michael J. Smith, President of Berkeley College; Linda Pinsky-Mauro, Campus Operating Officer, Berkeley College in Woodland Park; Dallas Reed, PhD, Berkeley College Vice President, Student Development and Campus Life; Windy White, Executive Director, The Three Doctors Foundation; Ashante Barnes-Connor, Assistant Dean, Student Development and Campus Life; Briahna Reinstein, Miss New Jersey Teen USA; Chhavi Verg, Miss New Jersey USA; Jovannie Lorenzo, Development and Marketing Manager, Boys & Girls Club of Passaic & Paterson; Quadhir Cline, Berkeley College student, and founder of Cline.NYC; Manuel Deleon, Berkeley College student, and co-founder of Fabricated Lifestyles; and LaTysha Gaines, Assistant Vice President, Student Development and Campus Life. Throughout the event, student models appeared on the runway while sporting clothing designed by Berkeley College student Quadhir Cline of Elmwood Park, NJ. Mr. Cline is a Berkeley College Honors student pursuing a B.B.A. in Fashion Merchandising and Management, and expects to graduate from Berkeley College in Fall 2017. In 2016, he founded Cline.NYC, an e-commerce boutique that provides affordable high-fashion womenswear. He is also the President of the Berkeley College Fashion Club in Woodland Park, and helped organize performances and student stylists for A Knight of Style Fashion Show. A Knight of Style Fashion Show also featured choreographed dances from the Berkeley College Royal Heat Dance Squad, as well as musical performances from students Dashawn “Eccentric” Dennis of East Orange, NJ, and Karla Naranjo of Belleville, NJ. Berkeley College student Elijah Phillips of Paterson, NJ, and Earl Brown, Berkeley College Business Developer, Career Services, served as the event’s co-hosts, with additional musical accompaniment provided by Berkeley College student Jerry “DJ Twichi” Ubah of Elizabeth, NJ. Photo Caption C: The Berkeley College Royal Heat Dance Squad perform during A Knight of Style Fashion Show in Woodland Park, NJ, on December 16, 2016, while modeling outfits designed by Berkeley College student Manuel Deleon’s lifestyle brand, Fabricated Lifestyles. 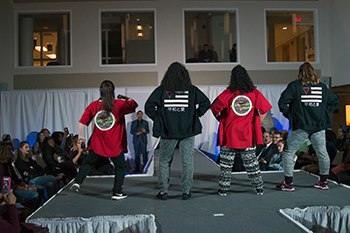 In addition to Mr. Cline’s designs, the Royal Heat Dance Squad modeled outfits designed by Berkeley College student Manuel Deleon’s lifestyle brand, Fabricated Lifestyles, during their performances. Mr. Deleon was one of the first students to be accepted into the Berkeley College School of Graduate Studies’ Master of Business Administration in Management program in 2015, and expects to graduate in May 2017. Photo Caption A (top) and D (above): Berkeley College students in Woodland Park, NJ, model styles designed by their peers during A Knight of Style Fashion Show on December 16, 2016. The event collected more than 200 toys for children in need.